Non-enveloped, spherical, about 32-34 nm in diameter. 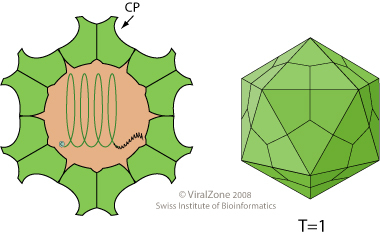 The RNA genome is enclosed within a capsid that is composed of 60 capsid proteins, assembled into a T=1 icosahedral particle. Monopartite, linear, ssRNA(+) genome of 7.2 kb. The 5' end is capped and the 3' terminus is polyadenylated. Their is no VPg at the 5'-terminus of the genome. The genome consists of three partially overlapping ORFs. The virion RNA is infectious and serves as both the genome and viral messenger RNA. ORF 1 encodes the nonstructural proteins, it is not clear whether this polyprotein is cleaved or not; ORF 2 encodes the capsid protein; ORF 3 encodes a small immunogenic protein. ORF2 is translated by leaky scanning from the bicistronic ORF3-2 subgenomic RNA. Attachement of the virus to host receptors mediates internalization into the host cell by clathrin-mediated endocytosis. RNA genome is released into the cytoplasm. The positive-sense genomic ssRNA is translated into a processed ORF1 polyprotein to yield the mature non-structural proteins involved in RNA transcription. Expression of two other messenger RNAs, a 3.7 kb subgenomic one and a 2.0 kb coterminal one. NATURAL HOSTS Human, pig, wild boar, monkey, some rodents, chicken. TROPISM Primary site of infection: possibly the intestinal tract. Secondary site of infection: hepatocytes and possibly cells in the biliary tract. GEOGRAPHY Southeast and central Asia, Africa, North America (Mexico), South America, Australia. ASSOCIATED DISEASES Hepatitis. Associated with a high mortality rate during pregnancy. Amongst chickens, avian hepatitis E virus is the cause of hepatitis-splenomegaly (HS) syndrome. HEV ORF3 protein suppresses host interferon-α signaling by inhibiting STAT1 phosphorylation .